Poet Jesús Papoleto Meléndez is the true voice of a poet... Papoleto brings us closer through his magnify glass of words... His poetry represents freedom of speech and thinking, bringing voice to the often silenced perspectives in our society. Jesús Papoleto Meléndez is a living spanglish lexicon, Hey Yo! Yo Soy! is a testament to the dedication & documentation of the nuyorican experience, it carries so many words in between the pages: longevity, strength, survival, transformation. a very necessary piece in the literary history of Puerto Ricans in New York. His energetic and exuberant readings of his poetry joyfully celebrated the blending of Latino and American culture and heritage…personally, Jesús is warm and engaging and members of the audience thoroughly enjoyed the opportunity to meet and interact with him before and after the event. 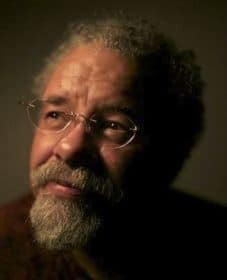 Jesús Papoleto Meléndez (“Papo”) is a New York-born Puerto Rican award-winning poet most associated with the Nuyorican movement. A poetry-facilitator working in the public schools, Meléndez’ career spans over 30-years, during which time he has coordinated many successful “Poetry/Creative Writing” workshops, affecting the lives of thousands of young people. He has developed a unique program that offers cross-curriculum creative writing experiences, emphasizing poetic form and expression, while merging computer desktop publishing techniques and technology in the classroom. Meléndez recently published his long-awaited poetry collection, Hey Yo! Yo Soy! 40 Years of Nuyorican Street Poetry, A Bilingual Edition (2Leaf Press, 2012). This 300-page collection, comprised of his three previously published books, consist of 59 poems about growing up Puerto Rican in New York City’s El Barrio, during the 1960s and 1970s that remain extremely relevant to this day. Meléndez is a recipient of the Union Settlement Association “Innovation Award” (2011); The 1st Annual “El Reverendo Pedro Pietri Hand Award” in Poetry (2006); El Spirit Republic de Puerto Rico, El Puerto Rican Embassy; The Universes Poetic Ensemble Company Award in Appreciation of Inspiration & Commitment to the Development of the Company (2006); The Louis Reyes Rivera Lifetime Achievement Award (2004); a 2001 New York Foundation for the Arts Fellowship in Poetry; an Artist for Community Enrichment Award (ACE) from the Bronx Council on the Arts (1995); and a Combo (Combined Arts of San Diego) NEA Fellowship in Literature (1988).